An audit has found that Nigeria's state oil company overpaid the government $750m (£490m), but also found it had not properly accounted for $1.48bn. The financial report follows allegations in 2013 by then-central bank chief Lamido Sanusi that the firm had failed to account for about $20bn. 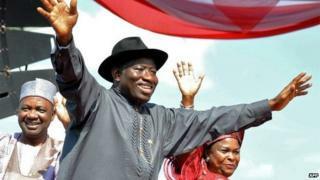 It caused a huge uproar in Nigeria, forcing President Goodluck Jonathan to order an independent audit. His office released the findings as he prepares to step down in a month. For the latest news, views and analysis see the BBC Africa Live page. Ex-military ruler Muhammadu Buhari will be inaugurated on 29 May after he defeated Mr Jonathan in elections last month. He has vowed to tackle corruption in Nigeria, Africa's main oil producer where most people live on less than $2 a day. The BBC's Chris Ewokor in the capital, Abuja, says the findings suggest that Mr Sanusi's claims were exaggerated. However, many Nigerians still believe that corruption in the oil sector runs deep, our correspondent adds. The audit into the accounts of the Nigerian National Petroleum Corporation (NNPC) was carried out by PwC, one of the world's leading accounting firms. It stated that it could not vouch for the integrity of the information it was given when it conducted the audit, our reporter says. PwC said the oil company should be overhauled and pay the government about $1.5bn arising from duplicate claims and accounting errors. Mr Sanusi, then a respected banker, caused shockwaves in September 2013 when he claimed that the NNPC had failed to account for $20bn of oil sold between January 2012 and July 2013. He was forced out of office following a heated row with Mr Jonathan and the NNPC over the allegation. Mr Sanusi, now a powerful Muslim traditional leader in Nigeria, has not commented on PwC's findings.